Oooooh, this was a controversial meal. Being one of my all time favourite meat dishes, I was very excited about making it for D for the first time. Just knew he’d adore this Greek dish as much as I do. Except he didn’t. At all. And I went in a total huff about it. For all the reasons I love this dish, D hated it. The pronounced flavour of the lamb, the fattiness of the cut, the fiddly effort to eat around the bone and the crinkly paper. I say all of these make a fun and highly tasty, occasional treat. D disagrees and would rather I’d made shepherd’s pie instead. Rub lamb shanks with salt and pepper. Cut slits into the meat and stuff in some slivers of garlic and thyme sprigs. Pile vegetables, herbs cheese and garlic onto a large double sheet of greaseproof paper. 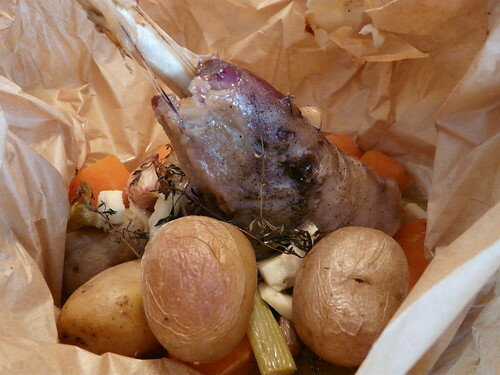 Place the lamb shank on top then gather the paper up around the package. Secure tightly with string. Place parcel into a roasting tray and pour in an inch of boiling water. Cook in the oven for 3 hours topping up the water when needed. Remove from the oven and serve in the paper. What was D thinking? It sounds great and easy to do if you know how to tie knots. D’s got it all wrong…too bad, so sad. Wendy, your kleftiko looks fabulous…bravo and serve D some neaps next time. I have this problem, finding wonderful things to cook, and no-one here as enthusiastic about eating them as I am. Either total mutiny (wholegrains), or muted enthusiasm (some kind of “foreign” meat, as in kleftiko/shepherd’s pie). So glad I am not alone, but does anyone have any tips for dealing with this ???? Wow wendy this recipe is just fantastic!! I adore this photo so I’m sure it’s sooo delicious! Lambs shanks aint my thing (I would much prefer a vegemite sandwich Zoe!) but I know how disheartening it is when your nearest and dearest does not share your enthusiasm for a meal you have made with your own hands! Oh dear! it’s a case of knowing when you might cross the boundary of taste! With my OH it’s a little tooooo much fresh ginger, twiggy sprigs of herbs (like the thyme in your kleftiko), too much black pepper or whole seeds – fennel, caraway, Oh! and cardamoms – never go there!!!!!! Eliane – It was ridiculously easy. 5 mins to prepare. 3 hours in the oven. Voila! Peter – Thank you! Great praise from the great Greek cook! Joanna – Afraid not. D is generally very open-minded about food. He just really didn’t like this. Johanna – That’s very true. Very true, indeed. How could he not like this?! I love lamb falling off the bone like this. I’ve not tried kleftiko before as I’ve only ever seen it done with a whole leg of lamb and like to experiment before serving things to a big group of guests. Don’t know why I didn’t think of trying it out with lamb shanks – great idea. Oh man, this looks good. If it weren’t insanely hot out today, I’d make this for dinner TONIGHT! I’ll have to wait for it to cool down. Luckily, if it has meat in it, ECG will eat it. Veggies? That’s another story. Looks pretty darn good to me! Great idea of putting it in the paper wrap. I sometimes do packets of fish and veggies in aluminum foil on the grill. Now a new idea for the packets! Look at it this way. If D did not like this dish but said he would rather have the shepherds pie, yours must be pretty special or he would not have mentioned it! I can’t imagine not loving kleftiko! It’s a favorite of mine. 🙂 Yours looks delicious! Deb – Thank you! And yes, I was pleased he at least requested another one of my dishes. Elly – Mine too. Thank you! Wendy, you have my full support. We love shanks at our place. I usually do a sort of casserole in the oven. That way, I can skim off the fat that melts off the shanks. This Lamb Kleftiko recipe would be a good way of widening my shank repertoire, so thanks for the recipe. I kow the predicament. Kels likes lamb but hates lambshanks for all the same reasons. I have to lobby her for months before i can make them. So basically i am able to get her to agree to another go about once a year. Next year i’ll try your recipe out 😉 it looks YUM. Mel – Suspect I’ll have to wait a year before D will try shanks again too! You are a amazingly talented photographer and your dog is a cutie. As for the Kleftiko – my hubby will be so impressed if I make this for him. He had this in Greece and has never stopped nagging me. Nina – Thank you so much from me and Marco. 🙂 Hope your husband enjoys this. I tried it for the first time in Greece too and never forgot it.